This is a section of the website where I hope to keep everyone up to date about what we are doing. 1. We are pleased to announce a gig in Tokyo!!!! I am told it is an all night of psychedelic music event. The show starts at 9:00 pm and we will be going on about midnight. Tom will be in Tokyo just for the gig but I hope to extend my stay for a week to 10 days. Hope to see you there. 2. Original art work from Hot!! video on Display. As I was working on the new video for Hot!! from "Search for Intelligent Life" a friend of mine asked to see the paintings I was doing for the video. He was so taken by them that he asked me if he could show them and offer them for sale. So..... he chose seven of the paintings (ones most appropriate for the venue) which have been matted and framed and they will be on display July and August 2001 at the Starbucks at 2222 Filmore Street, San Francisco Ca. For details about the show and sale contact Bob Duncan 415 351 1999. Click here to see "HOT!! ", the new video from the new album, Search for Intelligent Life! 3. Bralove working with Mobius Cubed. I have been working with a new trio called Mobius Cubed. 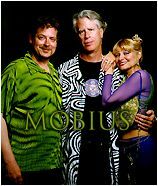 This is an electronica dance oriented trio which consists of Joie Favier on vocals, Michael Gosney as DJ and Bob Bralove on keyboards. We have been playing around the Bay Area to a wonderful response and just finished a gig at the Howwierd Street Faire (Howard and ninth streets). It is a lot of fun. Stay tuned for releases of original material. 4. Bralove finishing work on Sound Track to "I AM"
I am just finishing work on a sound track for "I AM" a film written and financed by Joe Firmage. This project has kept me in the studio many wonderful hours. The film has changed many times since it was originally presented to me and so the score has gone through many iterations. I am now working on what looks to be the final version. I have been lucky enough to be responsible for most of the sound track including sound design. The sound design work I was able to do with friends at Skywalker Sound (the George Lucas facility) and it was a blast. 5. TC has been keeping a strong schedule on the road. His upcoming dates are below.